Tender and juicy on the inside with a savory crispy outside make this one of the best damn crispy fried chicken recipes you will ever have. 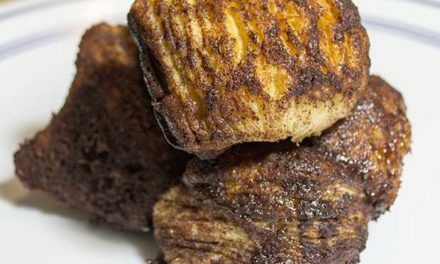 Simply spiced, double dipped, and fried to perfection, you can’t go wrong with this recipe. Damn, I love fried chicken! Crispy fried chicken is a dish consisting of chicken pieces like thighs and drumsticks, that is breaded and either deep fried, pan fried or pressure cooked to create a golden brown crispy crust around the chicken. In other words, fried chicken is a damn delicious dish! I mean who the hell doesn’t like fried food? There are a lot of us who say we probably shouldn’t eat it, but screw that. Every now and then ya gotta live, and part of living is eating great food! While a lot of people will tell you that fried chicken came from the American south, the truth is that Asia has fried chicken too. The two dishes are different, however, as the Southern fried chicken is spiced differently that Asian fried chicken. One of my favorite Thai restaurants in Seattle has some of the best fried chicken I have ever had, but it is nothing like this recipe for crispy fried chicken, which I also think is so damn delicious. Woks are perfect for deep frying crispy fried chicken. I did not even know there was such a day until I started researching crispy fried chicken for this post. It turns out that national fried chicken day is July 6th. People will pile into restaurants, make it at home or have a picnic to celebrate this our favorite comfort food. Who the hell knew? I have just decided that July 6th is now my favorite damn day of the year! Brine for meat does two distinct things, adds flavor and tenderizes the meat. Brine does not have to be elaborate either. Last summer I worked at an annual party that a local couple throws every year. My job was to grill the chicken that the wife had already prepped in brine. Everyone was raving about how good this chicken was. I asked what she used for a brine. Her answer just plain old salt and pepper. Brine adds a lot to meat, but it can also ruin it if it is over brined. Don’t brine for more than eight hours tops. If you do, whoa Nelly, you won’t like it much. Another great brine is buttermilk. Buttermilk not only adds flavor but tenderized the meat as well. Oven-fried chicken is a thing mom used to do a lot. It can be a good thing too, but it really isn’t the same. If you are looking for fried chicken, make fried chicken, if you are looking for oven baked chicken with the breading, then make it. Oven fried chicken is pretty easy, Shake and Bake works really well, but you can also just toss the chicken in some flavored bread crumbs for the same effect. Also, make sure you bake it at a high temperature, around 425°F. With the bone in I cook it for about 40 minutes. Make sure the chicken reaches an internal temp of 165°F. You can also tell its done when the juices run clear. Crispy fried chicken thighs and legs are my favorite. The thing to remember with thighs and legs is that the bones will require you to cook the chicken longer. For this reason, I usually pan fry chicken thighs. I fill up the Wok with enough oil to submerge the chicken about halfway. I also don’t get the oil quite as hot as when I deep fry because I want the chicken to cook longer, about 10 minutes on each side. You still want a good sizzle when the chicken hits the oil, but it shouldn’t be smoking. Again, make sure the internal temp is at 165° F. An instant-read thermometer will help you determine this. A deliciously fried chicken thigh. 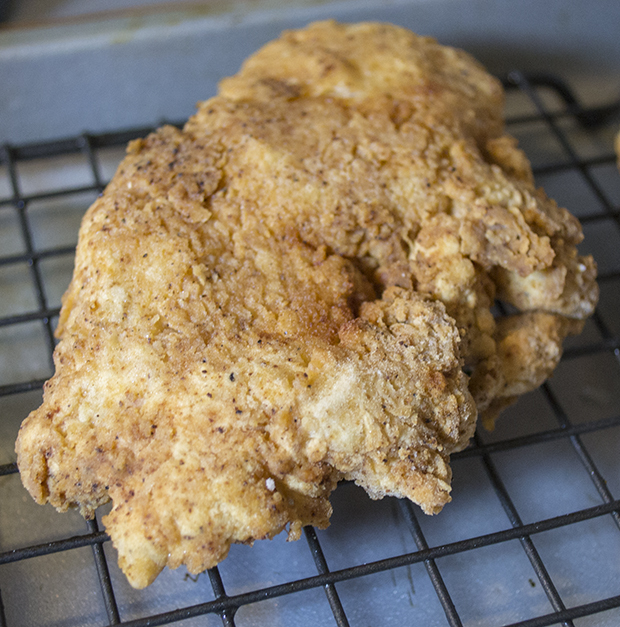 When I make crispy fried chicken using breast meat, it is almost always skinless and boneless. So I prep it by cutting it into chicken fingers and fry it up that way. The reason is one, it is easier and more fun to eat. Two, it takes less time to cook. If you decide to use bone-in with skin on, then I recommend cutting the breast in half so that it will cook better. Too large of a piece of meat will take a long time to cook and could result in a very dark fried chicken. Again, make sure it has an internal temperature of 165° F.
As I mentioned, using boneless skinless chicken is both quick to make and fun to eat. You can serve the chicken with barbecue, honey mustard, or any sauce you like. Here is a batch deep frying in my [easyazon_link identifier=”B002AQSWNE” locale=”US” tag=”thecu0a-20″]Asian wok[/easyazon_link]. I recently discovered how awesome an Asian wok is for deep frying. For pan frying, I think [easyazon_link identifier=”B06XDQ82G6″ locale=”US” tag=”thecu0a-20″]deep cast iron skillets[/easyazon_link] are my favorite, but the wok will work for that as well. 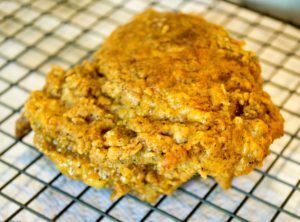 Fried chicken is made using a few different methods. Mom used to do it by pan frying it in a stick or two of butter. She would simply mix up some flour and spices in a bag, coat the chicken and fry it up. It was freaking delicious, crispy on the outside with a good amount of spices and juicy on the inside. I have experimented with various methods of frying chicken, and I found my favorite is the egg wash dipping method. 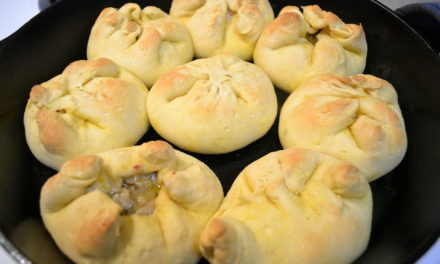 You coat the chicken in plain flour, dip it in eggs, then dip it in a spicy flour mixture. Then the chicken can be either pan fried or deep fried. If you pan fry, make sure you have at least enough oil to cover the chicken about halfway. I don’t use a batter per say, but rather, I dip the chicken as mentioned above. 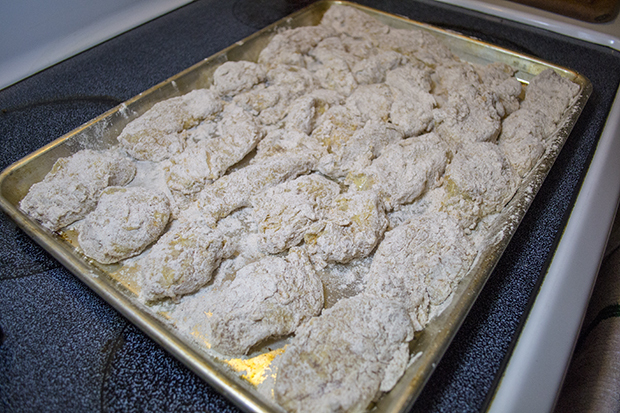 Once the chicken has been dipped and floured, I let it rest for about an hour in the refrigerator. What this does is it allows the egg dip to soak up the flour, thereby creating a batter of sorts. While I don’t use an actual batter, they work great too if you choose to go that route. There are lots of pre-packaged batters on the market or you can make one from scratch if you have a recipe. If you have one you like, please tell us about it in the comments below. I would love to know what brands work best. Chicken pieces double dipped for crispy fried chicken. The flour mixture can be spiced with anything you like. At a minimum, always use salt and black pepper. 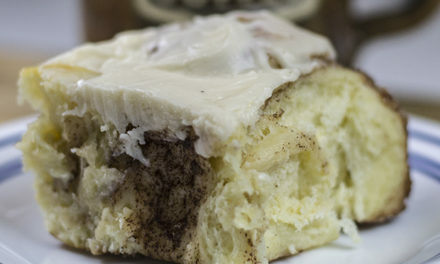 Some say the first flour dip does not need spices. 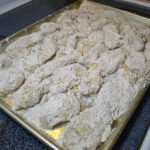 I would agree, but only on two conditions, one, if the chicken has been marinated in brine, and two, if instead of brine, you put a little salt and pepper directly on the chicken before it is coated with the first flour coating. It is also good to let the double dipped chicken rest a few minutes before cooking. This helps to make the batter stick a little better to the chicken and egg soaks up most of the flour turning it into a batter of sorts. You should always use at least enough oil to cover at least half the chicken for pan frying. If you are deep frying, then make sure the chicken is emersed in oil. I also like to use coconut oil because it is a bit healthier and still has a high smoke point. 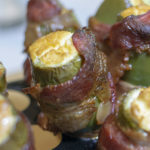 Peanut oil works really well too, however, use caution with peanut oil and make sure you are not serving your chicken to someone with a peanut allergy (like me). Canola oil works well too. Just avoid any oil that has a low smoke point such as olive oil. 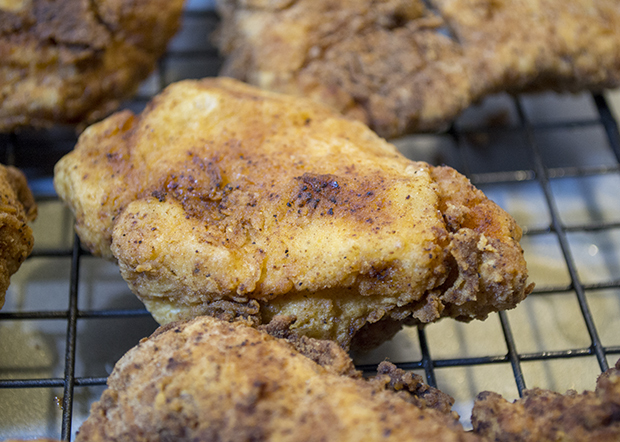 Here is my tried and true recipe for delicious crispy fried chicken. 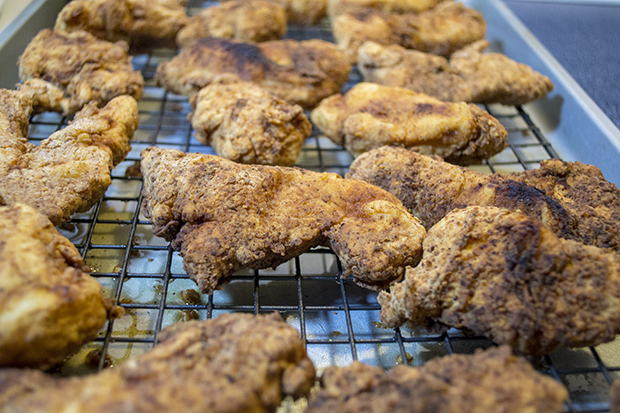 While it is not the only way to fry chicken, it is a damn good way. I always get huge compliments when someone new eats my chicken. I have been told by a few that it is probably the best damn fried chicken they have ever had. When someone says that to me, I feel I have an accomplished recipe that is a definite do again. I love hearing those words out of people when they eat my food. Delicious crispy fried chicken. 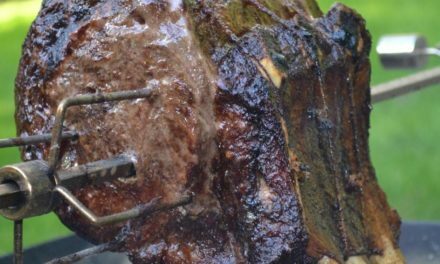 This recipe is tender and juicy and perfectly cooked. Brine the chicken about four hours before you plan on cooking. Rinse the brine off the chicken before you begin the next step. 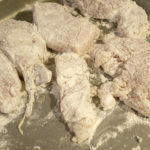 Take about a cup of the flour and toss it in a clean bag with the chicken. Shake the bag until the chicken is fully coated. Mix together all the spices in the remaining flour. Set aside. Using a whisk or a fork, beat the eggs until well mixed. Set aside. Set up the ingredients in the following manner. 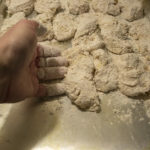 Place the floured chicken first in line, next, the egg wash, and finally the spiced flour. This is your dipping station. 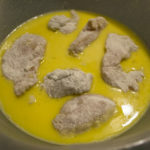 Now begin dipping the chicken in egg wash. Once the chicken is completely dipped, place it in the spicy flour mixture. Coat the chicken thoroughly with the spicy flour mixture and set aside in a clean pan. Repeat this for all your chicken and allow the chicken to rest in the refrigerator for about an hour before cooking. 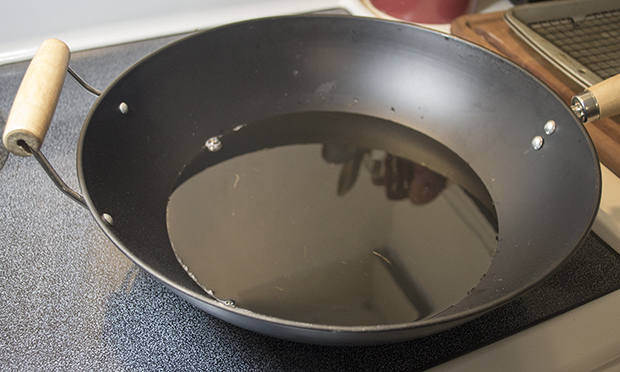 Using a deep cast iron skillet or an Asian wok, heat the oil. 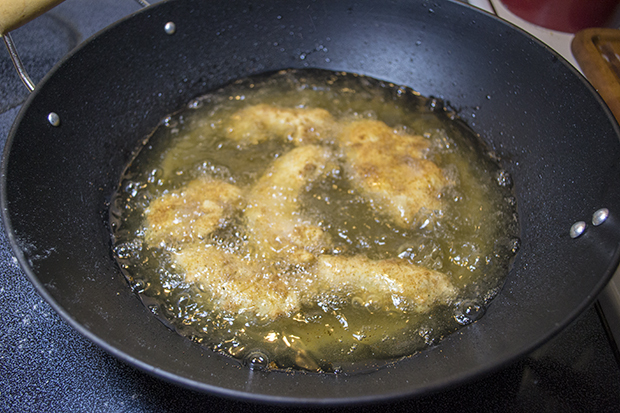 If deep frying, add around 2 to 3 inches oil or enough to immerse the chicken fully. 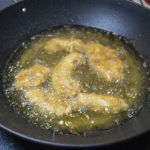 Place a candy thermometer in the oil to get the oil up to about 350° F. For pan frying use about 1/2 to 1 inch of oil or enough to immerse the chicken about halfway. After the chicken has rested and the oil is hot. Place a few pieces in the oil. If deep frying, you may not need the full 10 to 15 minutes cooking time as it will cook faster. Pan fry on each side for 10 to 15 minutes. Note: bone-in chicken will take longer. Do not overcrowd the pan regardless of cooking method. Remove the chicken from the oil and insert an instant-read thermometer to check for doneness. Chicken is fully cooked at 165° F. If the chicken is not done, return to the oil for additional cooking. Place cooked chicken on a baking grate let the oil drip off and to rest a few minutes before serving. The chicken will be extremely hot so use caution when eating or handling. If you are making chicken that has the bone in, you will need to cook it longer. Chicken fingers take less time. Times here are for bone-in chicken. Also, do not use a paper towel to soak up the oil when resting the chicken. This can actually make the breading soggy. I use a baking sheet with a baker's cooling rack. 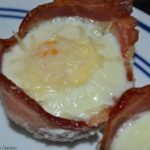 This recipe first appeared on July 12, 2016. It has been updated and improved for your enjoyments. It really is delicious. 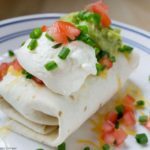 This recipe is one of my all-time favorite comfort foods.